Watch this short video to get an idea of the different volunteer opportunities available at Life Centers. You can save lives. Life Centers Client Advocates compassionately share the love of Christ and accurate medical information with women making pregnancy decisions. Click here for more information about becoming a Life Centers Client Advocate. Show compassion to those visiting our pregnancy centers by offering a welcoming smile and a kind word. Center Receptionists play a crucial role in making clients feel welcome, while assisting with daily center tasks such as answering phones, clerical support and data entry. To help reach the thousands of women Life Centers sees each year, we offer free pregnancy tests, education on pregnancy and sexual health issues, and ultrasounds. We always excited to add trained medical and ultrasound professionals to volunteer pool to help raise our standard of care. The Celebration of Life Banquet, the Walk + Run for Life, baby showers, bottle drives, etc. 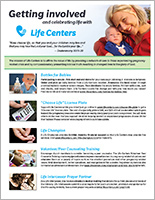 There is need for help with putting on all of the events at Life Centers. Without prayer, Life Centers would not exist. We need as many people as possible praying for us. Prayer intercessors commit to regularly pray for Life Centers. If you are interested in volunteering at Life Centers, please fill out the Volunteer Interest Form and we will be in touch soon.